Mammalian genomes are spatially organized into compartments, topologically associating domains (TADs), and loops to facilitate gene regulation and other chromosomal functions. 3D interactions mostly occur within chromosomes (cis) rather than between chromosomes (trans), all methods detected more cis than trans interactions. The total number of interactions called by each method increased with the number of reads retained by the filtering step for all tools at any resolution, although the rate of increase varied from tool to tool. 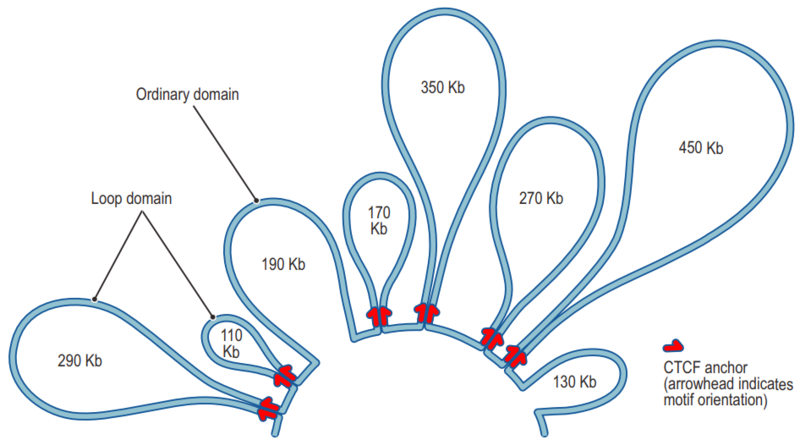 The genome-wide chromosome conformation capture (Hi-C) has revealed that the eukaryotic genome can be partitioned into A and B compartments that have distinctive chromatin and transcription features. The current method for calculating A/B compartments is based on the Principal Component Analysis (PCA) of the normalized Hi-C interaction matrix (Lieberman-Aiden et al., 2009). The first eigenvector (Principal Component 1, PC1) of the correlation matrix is then defined as the compartment score, and genomic windows with positive or negative compartment scores are defined as A or B compartment, respectively. HiCCUPS is an algorithm for finding chromatin loops. HiCCUPS retained the largest number of aligned reads, although it is worth noting that HiCCUPS filters only PCR duplicates without discarding other potential artifact reads. 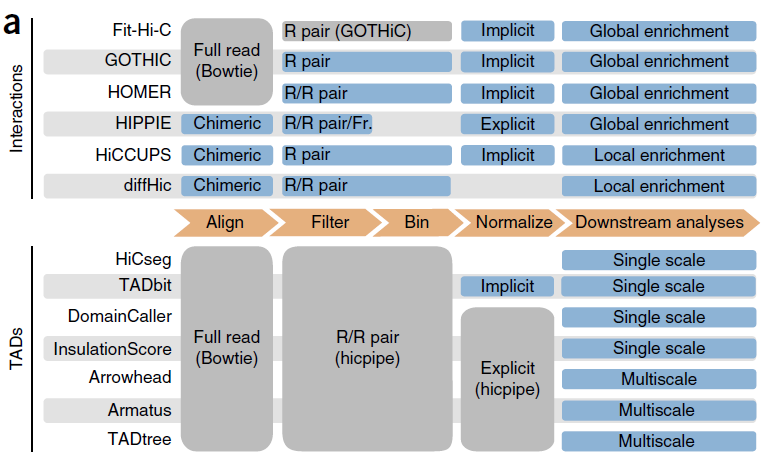 diffHic filtered the highest proportion of aligned reads in most data sets (from 27% to 94%, depending on the data set); but, given its higher alignment rate, still retained a large number of reads. HiCCUPS, which aggregates nearby peaks into a single interaction, identified fewer interactions than all other tools. For interaction callers, HOMER and HiCCUPS yielded the highest proportion of interactions with a potential biological significance—although the potential of HiCCUPS could be fully exploited only in the analysis of very high-resolution data sets. At 5 kb, Fit-Hi-C called interactions at an average distance of more than 10 Mb; which was expected, as Fit-Hi-C is designed to call midrange interactions. At low resolution, GOTHiC had the highest concordance, most likely because it called a large number of short-range interactions in every sample replicate. At high resolution, the interactions found by HiCCUPS were the most conserved among replicates. At 5kb resolution, HiCCUPS and HOMER called the highest proportion of promoter–enhancer interactions, although not the highest absolute number. GOTHiC recovered the largest number of true-positive interactions. HOMER and Fit-Hi-C performed comparably to GOTHiC, although they called a smaller number of total interactions. In high-resolution data sets, diffHic recalled the highest number of true positives, although HOMER identified more true positives than any other tool at comparable numbers of called interactions. The highest sensitivity was achieved by Fit-Hi-C. The number of TADs did not increase with the number of reads retained after filtering for all tools, with the exception of Arrowhead. At 40-kb resolution, TADtree called the largest (7,638) and Arrowhead the smallest (636) number of TADs. Conversely, at 1-Mb resolution, InsulationScore returned the largest number of TADs. Note that some methods (HiCseg, TADbit, InsulationScore) partition chromosomes in a continuous set of TADs, whereas the others allow gaps between TADs. Arrowhead and TADtree, which adopt multiscale approaches, returned nested TADs. TADs identified by HiCseg were also the most reproducible when using the overlap coefficient.